Flooding is claiming lives in Kebbi State and across Nigeria. Most African countries have made strong progress in achieving major development goals in the last few years. Despite this much needed progress, the past decade has seen flooding damage or destroy much of this same infrastructure, affecting millions and killing hundreds every year. In 2018 alone - up to September 15 - based on conservative estimates, flooding across Sub-Saharan Africa has destroyed more than 10,000 homes and affected more than 2m people. A recent study suggested that floods cost Tanzania US$2 billion annually. 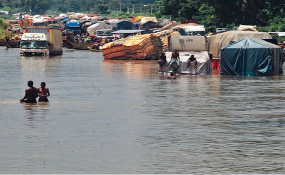 In 2012, Nigeria experienced one of its largest floods in a century, destroying assets worth nearly US$10 billion. In Mozambique, one of the poorest countries in the world, floods in 2013 were estimated to cost over US$500m - nearly 9% of GDP. These figures are significant, especially when considering that this money could have been invested in other developmental goals. In Africa, about 3,000 people die daily from diseases linked to poor sanitation, poor hygiene and contaminated water, particularly diarrhoea and malaria. This situation is worsened by flooding, which will make it harder to achieve SDG 6- ensuring access to water and sanitation for all. First is to place greater focus on adaptation strategies, alongside mitigation. Before now, most of the efforts across Africa have been "hard" engineered routes to mitigate flood impacts. This means working against rather than with nature, for instance by building dams or embankments. A particularly good initiative that incorporated such adaptation strategies was the Makoko floating school. The school is a prototype floating structure, built for the historic water community of Makoko, located on the lagoon heart of Nigeria's largest city, Lagos. As a pilot project, it has taken an innovative approach to address the community's social and physical needs in view of the impact of climate change and a rapidly urbanising Africa. More efforts should be channelled towards strengthening and scaling up such initiatives. The second major change is to scale up "soft" non-structural adaptation measures, such as ecosystem-based approaches to flooding. These involve measures which work with the natural flood cycle rather that struggling against it. These solutions include the widening of natural flood plains, planting more trees, protecting and expanding wetlands, and investing in urban green spaces to reduce water run off. This could be beneficial considering that most African countries do not have sufficient finances to justify the costs of dams and other "hard" engineering. As competing with education and agriculture expenditure priorities is unlikely to end well in such a poor economy, "soft" non-structural adaptation measures may provide a more promising route. Policy makers often see flooding as a humanitarian issue only - they must be reminded that there is an economic dimension too. There is evidence that ecosystem-based adaptations are helping people, particularly women and children, adapt to climate variability and reduce their vulnerability to climate impacts.